Neewer 3-PACK 250W Studio Strobe Flash Photography Lighting Kit:(3)Monolight, (3)Softbox, (3)Light Stand, (1)RT-16 Wireless Trigger, (2)RT-16 Wireless Receiver, (1)Bag for Video Portrait Location Shooting. Note:This item comes with a UK mains adapter permanently fixed to the power cord. The mains adapter is fused and complies with BS 1363 regulations. (3)250W 5600K Strobe Flash with 75W Modeling Lamp. Flash Energy Adjustment: 1.0-6.0 Digital Dimmings. Modeling Lamp: GY6.35 75W. Modeling Lamp Adjustment: Prop, Full, Off. Recharging Time(s): 0.3-1.7. Recharging Reminder: Sound, LED Indication. Color Temperature: 5600K +/- 200K. Trigger Mode: Photosensor, Flash Trigger, Test Button Trigger. (3)20x28 inches/50x70 centimeters Softbox. The large size of the softbox makes it desirable for fashion photography, portraits and medium to large sized product shots. Removable front cover for camera lens access to the interior. (1)6.5 feet/2 meters Light Stand. Height: 6.5 feet/2 meters. Folded Height: 3 feet/92 centimeters. Max Load Capacity: 17.5 pounds/ 8 kilograms. (1)RT-16 Wireless Trigger and (2)Receiver. Plug size of receiver: 3.5mm. The receiver has an on/off switch, and an LED to indicate triggering. Channel Selector outside the transmitter and the receiver. Power Input of Transmitter: 23A 12V battery (included). Power Input of Receiver: 2 x AAA batteries (not included). (1)30x10x10 inches/77x25x25centimeters Carrying Bag. Lightweight and foldable, have one padded compartments inside. Weather resistant vinyl case made to carry a tripod up to 30 inches long. 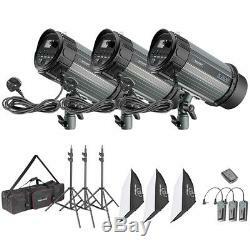 KIT INCLUDES: (3)250W 5600K Strobe Flash with 75W Modeling Lamp, (3)20x28 inches/50x70 centimeters Softbox, (3)6.5 feet/2 meters Light Stand, (1)RT-16 Wireless Trigger, (2)RT-16 Wireless Receiver, (1)30x10x10 inches/77x25x25centimeters Carrying Bag. 250W 5600K MONOLIGHT: With high flash energy 250WS, Guide Number GN45, 60 steps from 1.0 to 6.0 in 0.1 increments; Recharging time:0.3-1.7s; Sync Distance:10 meters; Flash Duration:1/2200s, the light intensity is quite strong enough; can be handheld or mounted on a light stand; can work as main light, back light or hair light, and form different kinds of layout lighting. LIGHT STAND: 3-6.5feet/ 92-200centimeters adjustable height, solid safety 3 legs stages, capable for stable andheavy duty work. And it uses quick single action locks, providing fast precision height adjustment. SOFTBOX: Diffuses the light and gives you perfect even lighting when you need for the best shots possible; Has been assembled and disassembled but never used; Removable front cover for camera lens access to the interior. RT-16 REMOTE TRIGGERING SET: The wireless trigger controls discreteness for camera to trigger hot shoe flashgun synchronously; High-speed and synchronous for 1/200 second; Max. Working distance reaches at 30 meters(open area, without interference). This item is 100% Brand New. We will reply you with 24 hours. Please leave us 5 star feedback. We could resolve the problem, because we believe everything could be resolved through communication, THANK YOU! The item "Neewer 750W Studio Strobe Flash Monolight Lighting Kit with Softbox and Stand" is in sale since Wednesday, January 16, 2019. This item is in the category "Cameras & Photography\Lighting & Studio\Flash Lighting\Monolight Flashes". The seller is "miketech-1" and is located in Swansea, Wales. This item can be shipped to United Kingdom.